The 2 winners of the giveaways chosen at random are Barb from Washington and Karen of What’s In Our Lunch Bags? blog. Thank you again to all of you for continuing to read, comment and for your kind words regarding the loss of my dad. This lunch sort of reminds me of something I should do for Valentine’s day, but love for my kids is year round so I make a lot of heart themed lunches. This one is Rudi’s Whole Grain bread made with my large heart pocket sandwich maker. I used the heart picks to skewer all the surrounding yummies. Mini tomatoes on either side and raspberries and blueberries are around the sandwich. 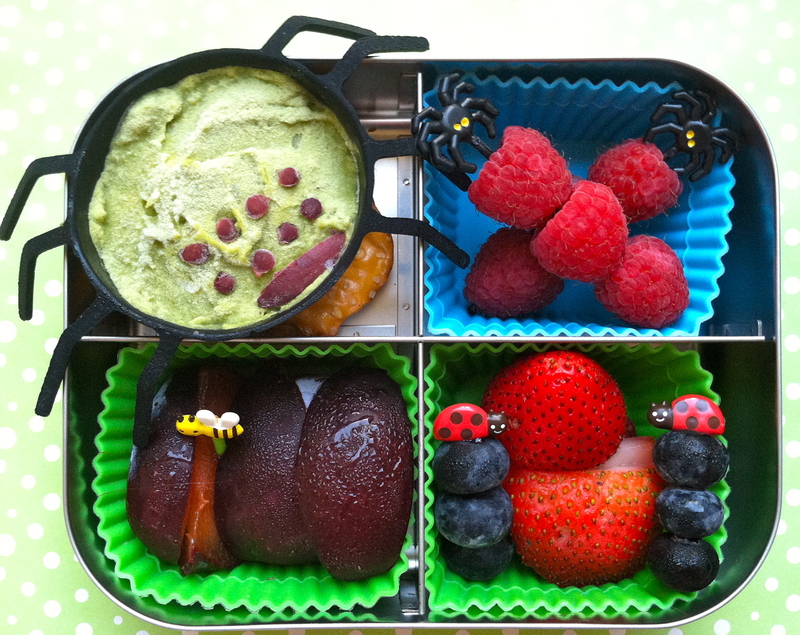 In the top left compartment are 2 Crimson Gold organic mini apples and in the top right are honeydew pieces with a fruit leather heart on top packed in her Easy Lunchboxes container. My 2 year old has a short morning at preschool which includes an early lunch. We were having issues with her filling up on the school snacks so I began bringing a few pieces of fruit each week to share with the class. It turns out all the kids like it, and they’re all eating healthier. Her lunch today is packed in a LunchBots Quad. From the top left are almond butter mini hearts made with Rudi’s brand Whole Grain bread, blueberries, green pears and apple hearts and raspberries. Both girls have ice water with their lunches. I promised to do a giveaway when I got to 1000 likes on Facebook. I didn’t forget! This Thanksgiving, I’m grateful for many things, family, friends, a wonderful house and neighborhood, my group of bento bloggers who have been so supportive, and I’m also grateful for you. Yes, YOU! I started this blog as a way of helping a handful of friends with creative ideas, and now there are almost 1100 people on Facebook alone that follow bentoriffic, over 600 on twitter (bentoriffic) , over 600 on Instagram (bentoriffic), over 500 on Pinterest and the list goes on. I really am grateful that you care, comment, read and offer suggestions. I’ve gone from carnivore to vegan, inspired and creative to some days just throwing it together like we moms do some days. I appreciate you sticking with me through it all. THANK YOU!!! These are the only turkeys my kids are eating this year. I used pie crust cutters I had from last year as sandwich cutters. My 4 year old’s lunch is a flock of turkeys on Rudi’s Whole Grain bread stuffed with almond butter. Above the turkeys are a sliced kiwi and cashews. 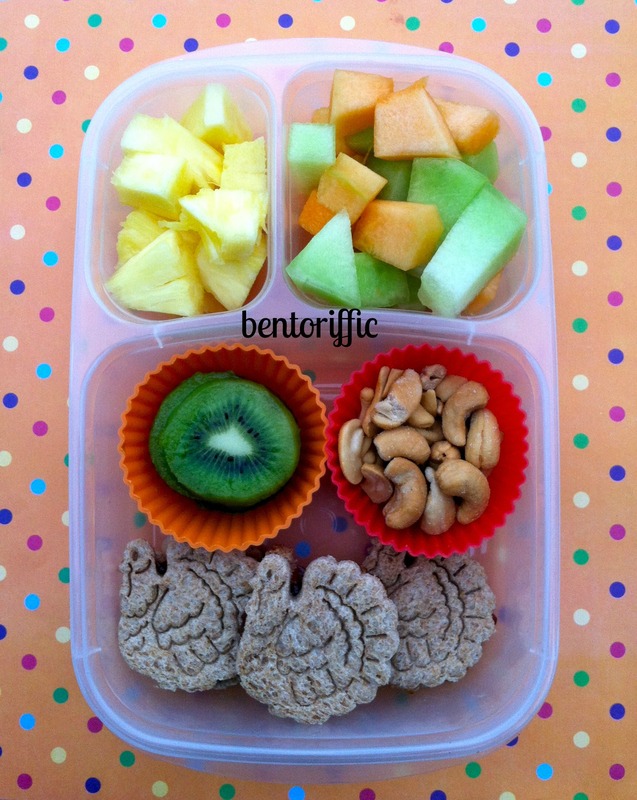 In the top compartments are pineapple, honeydew and cantaloupe pieces packed in her Easy LunchBoxes container. My 2 year old from the top left has raspberries, 2 of the same turkey shaped sandwiches on almond butter, maple leaf shaped watermelon pieces and dried cherries, Marcona almonds with maple leaf dried apricots on top packed in her LunchBots Quad. I decided on 2 separate prizes for the giveaway. The first drawing is open to residents of North America only. 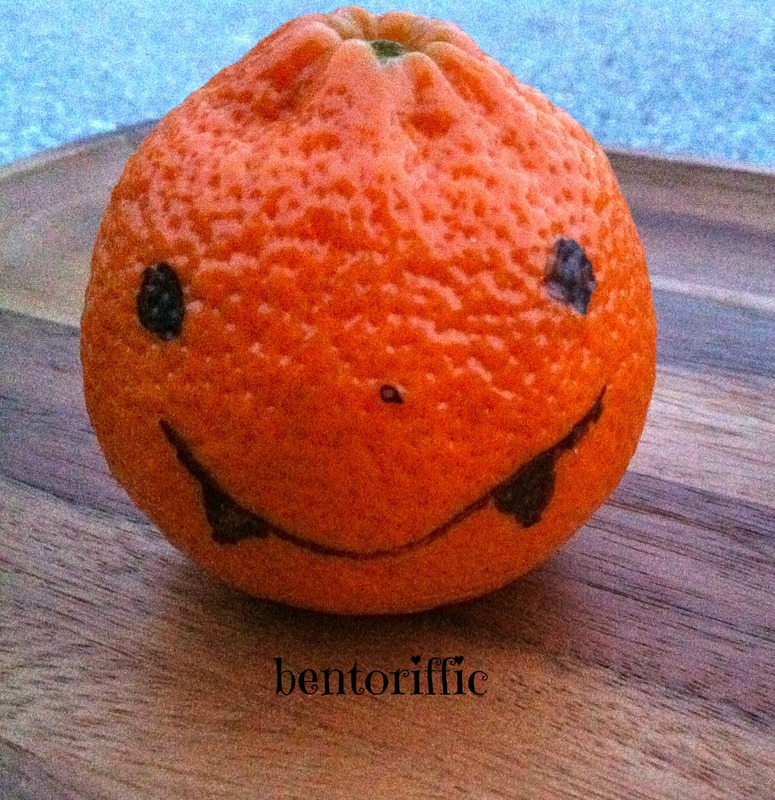 The second prize will be a $35 credit to spend at Bento USA by All Things For Sale and is open to readers worldwide. All you have to do to enter to win is leave me a comment telling me what you are grateful for this year and in which country you live. Please make sure you leave me a way to contact you, please! Both winners will be chosen when the contest ends on Wednesday, November 28th at 11:59pm by random.org. You will have 72 hours to respond or a new winner will be chosen. I admit there are days when I really miss the smell of dried leaves and the beautiful fall colors. For my 4 year old daughter’s lunch, I tried to make a little autumn in her Easy LunchBoxes container. I love finding new ways to reuse existing tools. 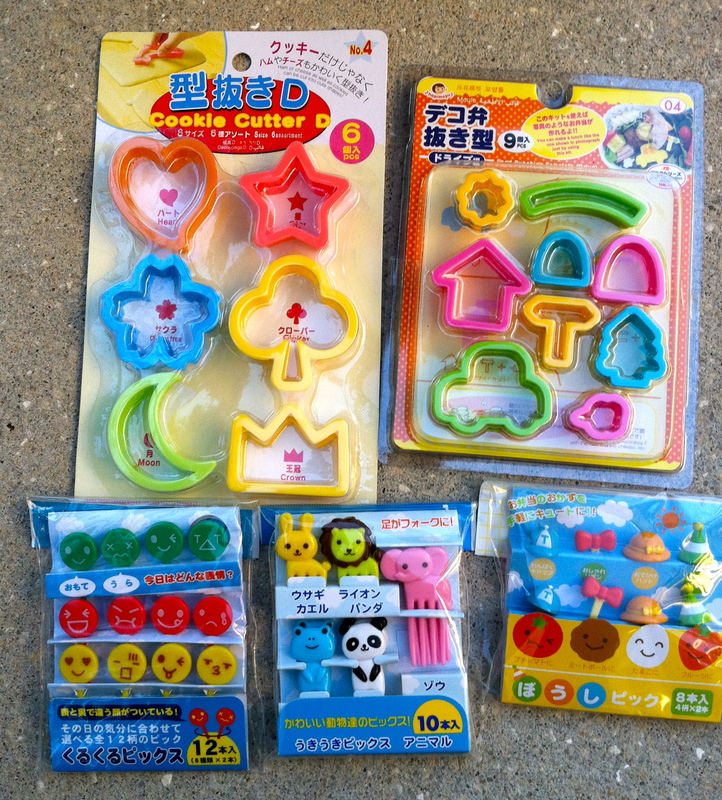 My readers have probably noticed my slight obsession with the small cookie cutter presses. I loved the patterns they leave in the sandwiches. This leaf cutter was part of a set for cutting fancy pie crusts. I use them year-round for cutting fruit, vegetables and mini sandwiches. The leaves are made from Rudi’s organic whole grain bread and filled with Trader Joe’s pumpkin butter. The tree trunk is two pretzel rods. Green grapes are the grass on a pick. The top left is filled with organic rapsberries with an oak leaf & acorn pick. In the top right there are 2 Crimson Gold tiny apples and a peeled clementine with a scarecrow pick. 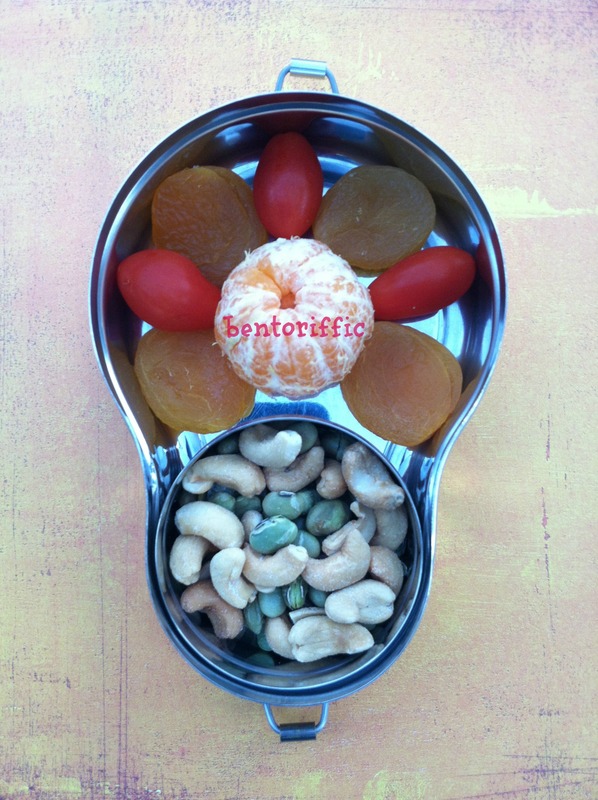 Miss G’s snack is a Happy Tiffin brand stainless bento filled with cashews and dried edamame in the bottom container. At the top are dried apricots, grape tomatoes and a peeled clementine. For my 2 year old daughter, I packed a LunchBots Quad. From the top left, she has long grain brown rice mixed with vegetables and black beluga lentils. Green grapes and raspberries are in yellow silicone ovals at the top right. 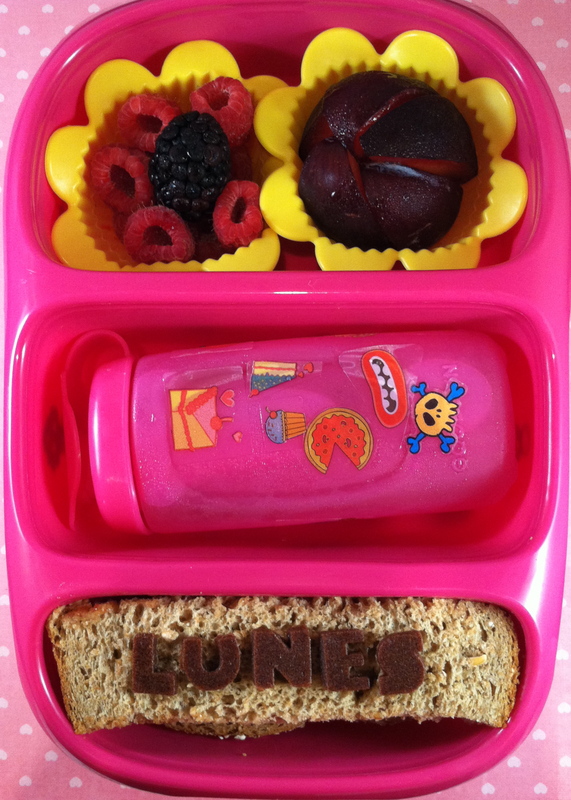 In the bottom right compartment are Rudi’s organic whole grain bread cut into mini ice cream cones with a small cookie cutter plunger and filled with Trader Joe’s pumpkin butter and in the bottom left compartment is a peeled clementine and a small silicone container of marcona almonds. Both girls have ice water with their lunches. My 4 year old loves her sandwiches. She has whole grain and pumpernickel puzzle pieces. I used the The Lunch Punch puzzle piece cutters for this one. I cut the bread first, fill the sandwiches and then reassemble the pieces. To the left is a pick of grape tomatoes and dried apricots. Above the sandwich are red seedless grapes. 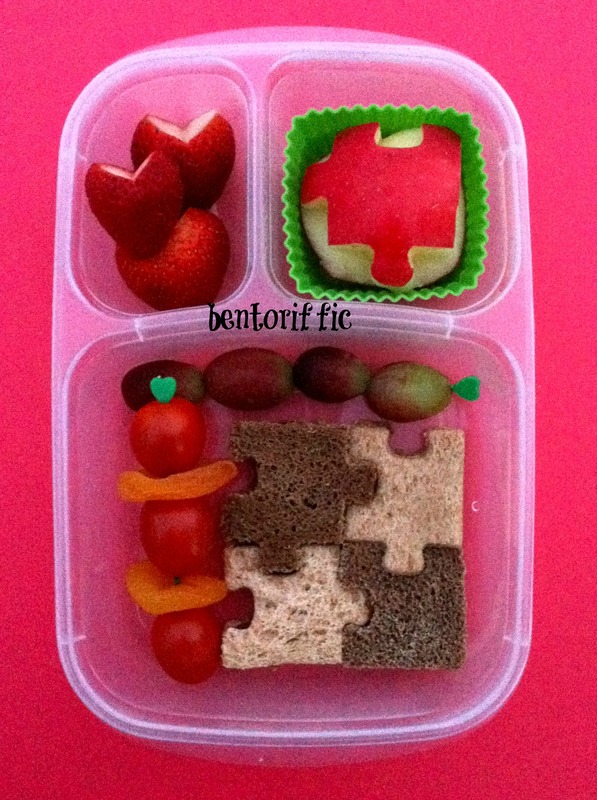 In the top left compartment of her Easy LunchBoxes are heart shaped strawberries and the top right are apple pieces. I soak the apples immediately in a bowl of cold water with a bit of lemon or lime juice to prevent browning. I soaked these for about 10 minutes and then toweled dry and put in the lunchbox. 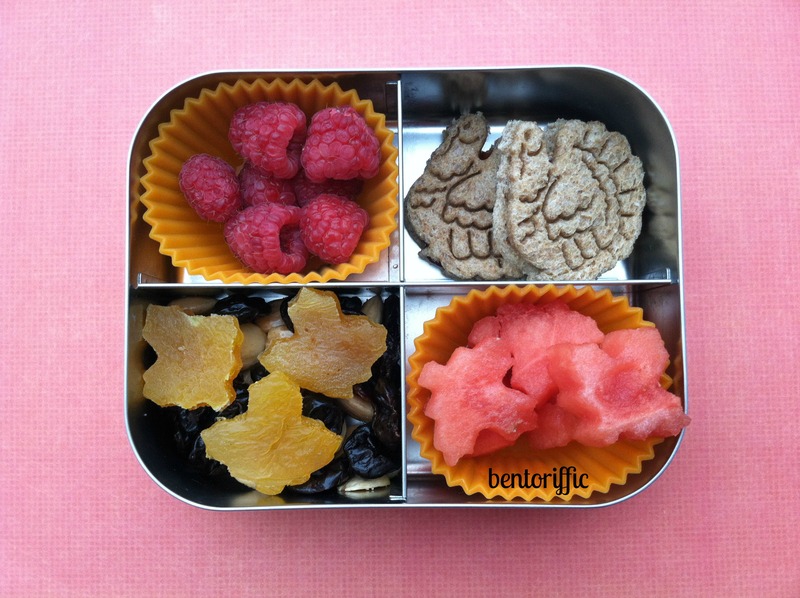 See this great post by Cristi of Bent On Better Lunches on different methods for preventing your fruits from browning in the lunchbox. 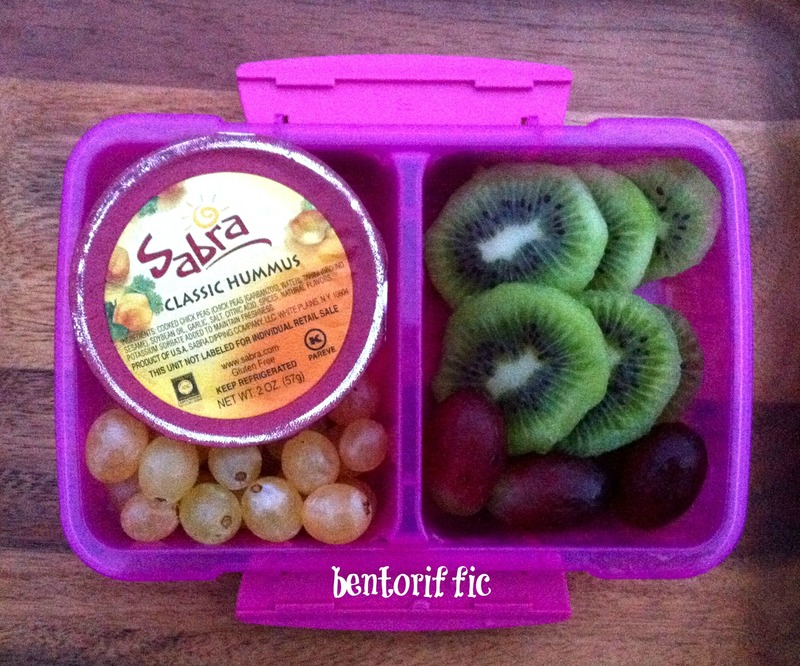 For her snack, Miss G has Sabra hummus with two different types of grapes and sliced kiwi. Not shown are crackers for dipping in the hummus. Still going on with the giant box of clementines we have, today’s face is a vampire. Stay tuned for one last Halloween lunch and a giveaway this week. Stay warm & safe, everyone! Thank goodness I put it on my calendar. I check my schedule last night, and Miss G’s school is celebrating International Peace Day today. 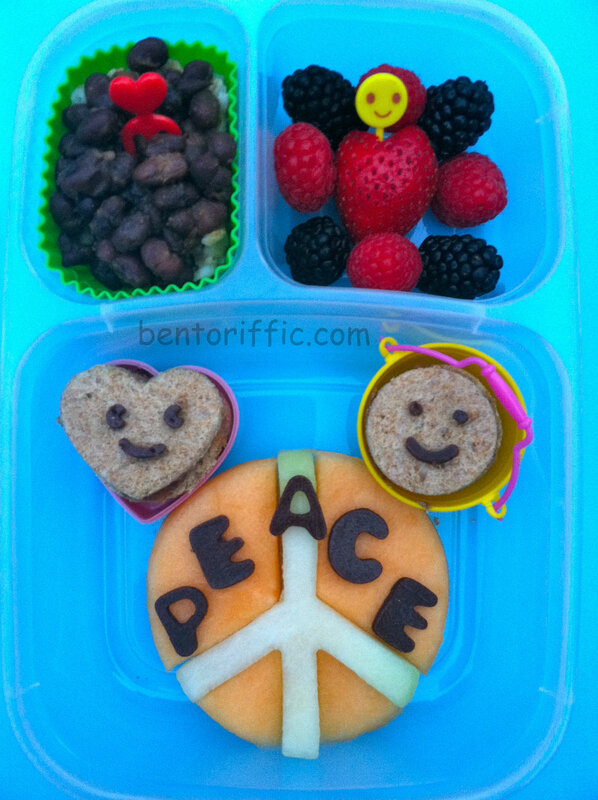 At first, I had a good laugh over what’s NOT appropriate for a kid’s lunch box that reminds me of peace and the 60s. Cheech & Chong movies, protests, stinky hippies, a lot of grass (and I don’t mean to walk on) and some really good music I will pass on to my kids some day. But for now, I decided on the basic peace sign lunch. At the top left are barley and brown rice and black beans on top. At the top right are blackberries, raspberries and a strawberry. The peace sign is cantaloupe and piel de sapo is the greenish white melon. It’s also called a Santa Claus melon and tastes a lot like honeydew. I used a cookie cutter to cut the melon. The PEACE letters are Stretch Island fruit leather. 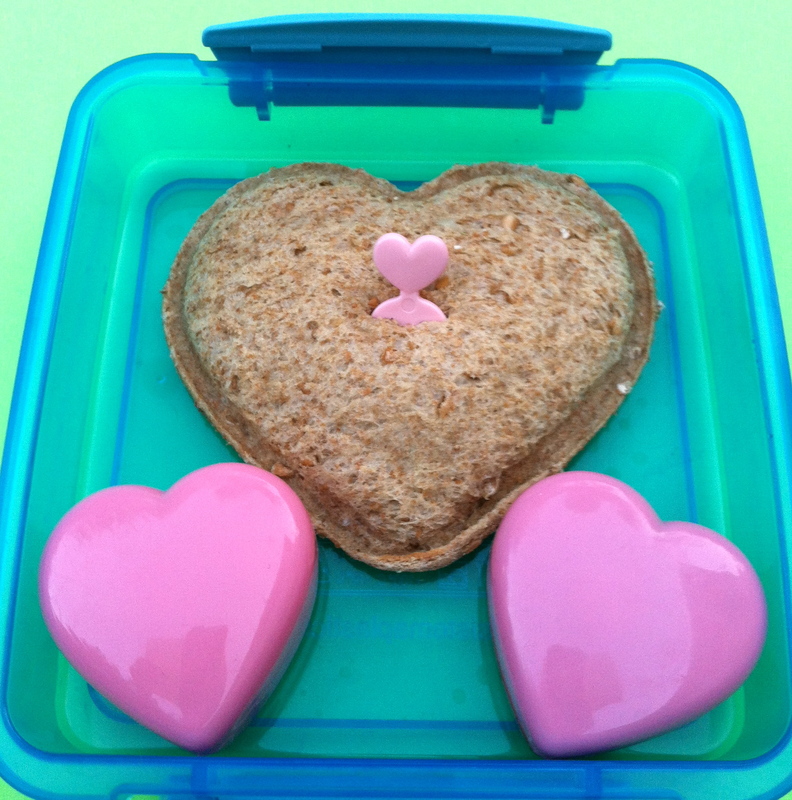 The heart and Have A Nice Day sandwiches are Rudi’s Whole Grain bread with almond butter and sliced berries with fruit leather faces packed in her Easy LunchBoxes container. In all seriousness, I think it’s great that they’re teaching 4 year olds about respecting others from all walks of life and all nations. Being kind to others always goes a long way in accepting even when we don’t understand. 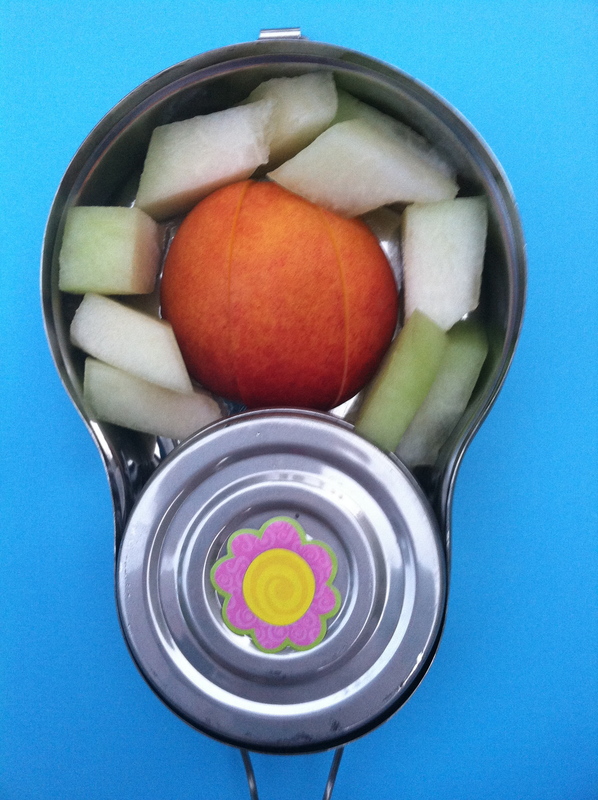 Miss G’s snack today is a sliced nectarine surrounded by more melon pieces. In the round container is So Delicious brand coconut milk strawberry yogurt packed in her Happy Tiffin stainless container. I’ve shared my love of farmer’s markets before. 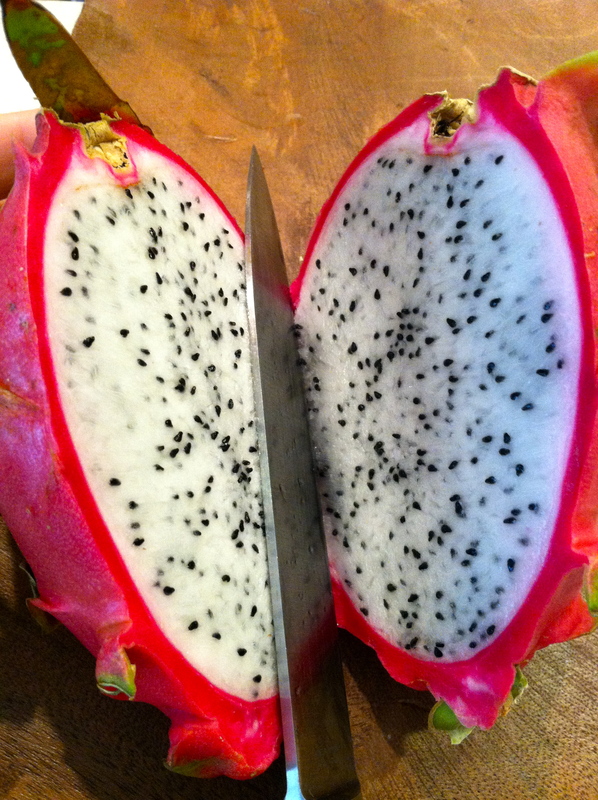 I made another trip this weekend and found some dragonfruit and some pear cactus at the Sarasota Farmer’s Market. The pear cactus turned out to be beautiful and in my opinion a pain to eat with all those tiny seeds. The kids did try and like the dragonfruit though. At the top right it’s mixed with pineapple chunks. It’s a bit like a pear but definitely has its own distinct taste. 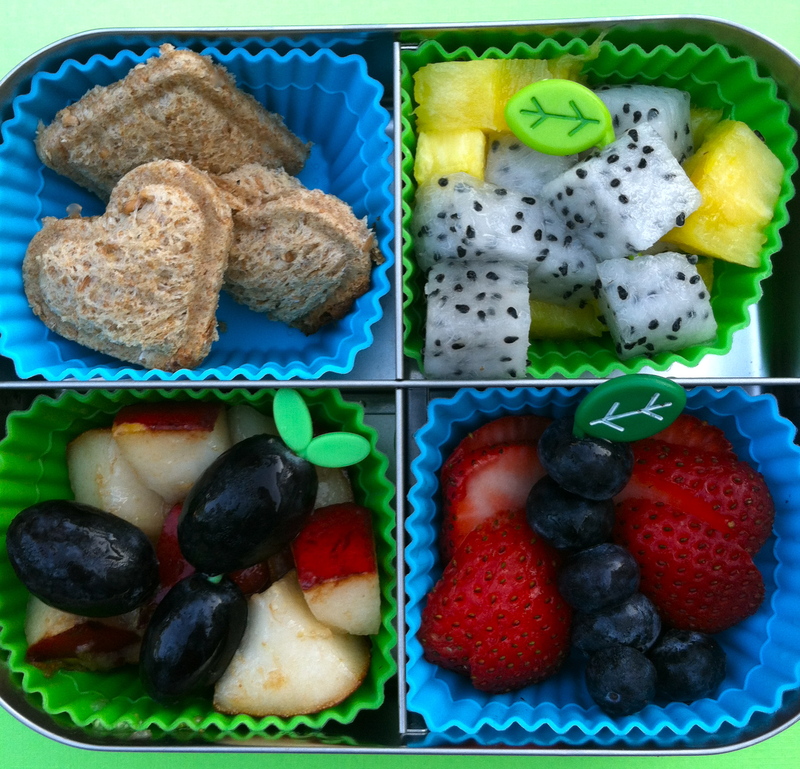 At the bottom right are sliced strawberries and blueberries and at bottom left are pears and grapes and almond butter heart pockets made of Rudi’s Whole Grain bread. The lunch is packed in LunchBots new Quad stainless container. 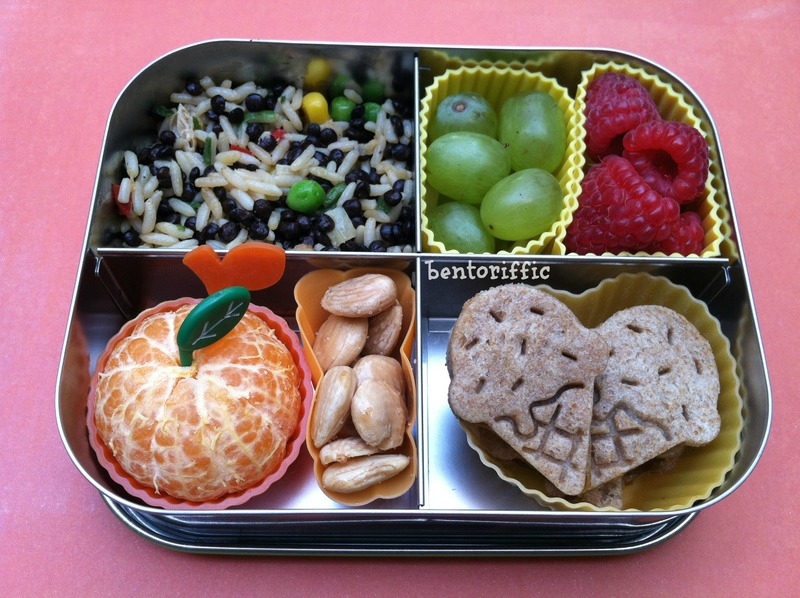 Miss G has a hear pocket sandwich and 2 small containers of dried fruit and nuts packed in her sistema container. 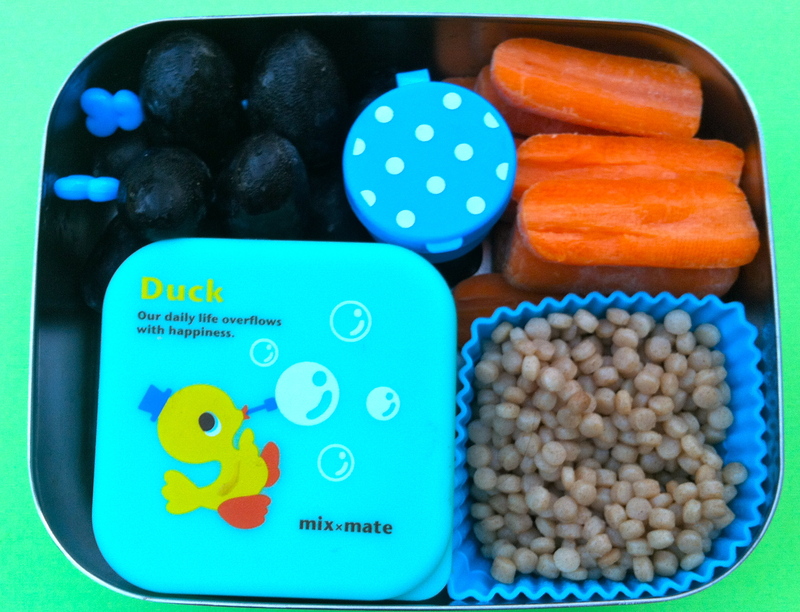 And she has a LunchBots Uno with black seedless grapes, halved mini carrots, honey mustard in the sauce container, whole wheat israeli cous cous and Whole Soy & Co. brand apricot & mango flavored soy yogurt in the Duck container. 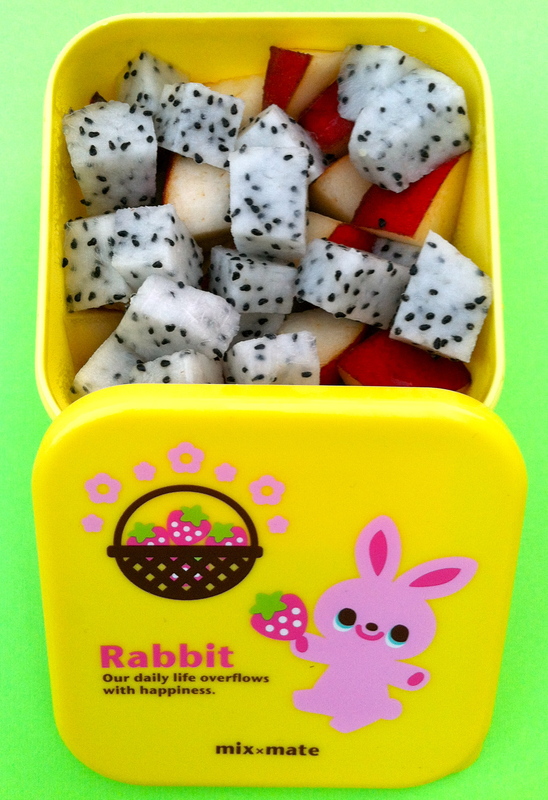 For her snack she has cubed dragonfruit and d’anjou pears in her new rabbit container. 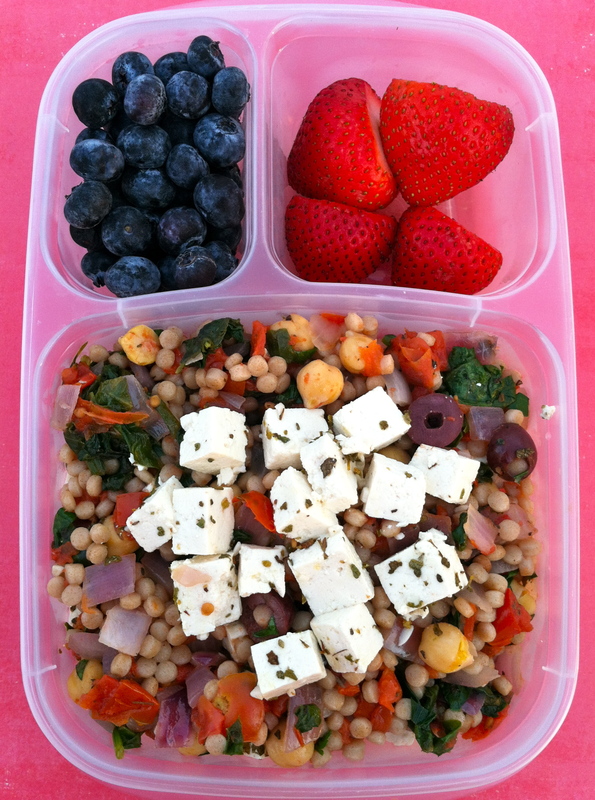 And my husband has leftover dinner of cous cous pilaf with spinach, chickpeas, tomatoes, red onions, olives, and marinaded tofu on top packed in his Easy LunchBox container. At the top are blueberries and strawberries. Tags: AllThingsForSale, blueberries, carrots, cashews, chickpeas, cous cous, d'anjou pears, dragonfruit, dried cranberries, duck, Easy LunchBoxes, fun food for kids, garbanzo beans, grapes, hearts, honey mustard, kalamata olives, leaves, LunchBots, marinaded tofu, pineapple, Rudi's whole grain bread, sistema, soy yogurt, strawberries, Whole Soy & Co.
Miss G has days of the week lessons in spanish this week so I made her a Lunes lunch today. In the top yellow flowers are raspberries with a blackberry in the middle and a sectioned plum on the right. In the middle is her ice water and the bottom compartment are almond butter and jam sandwiches with LUNES cut out in Stretch Island fruit leather letters packed in her raspberry Goodbyn Bynto box. 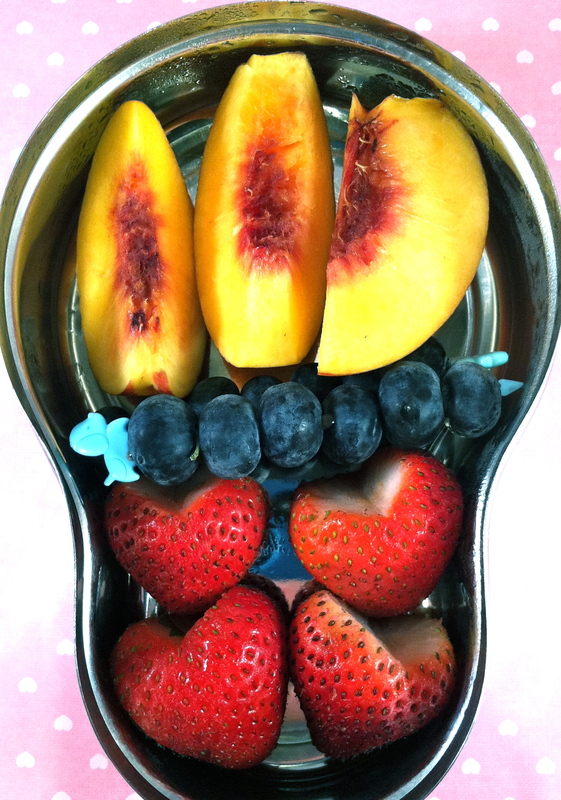 For her snack today, nectarines, blueberry picks and strawberry hearts are packed in her Happy Tiffin stainless bento. Little Miss A, 2, is having an insect filled lunch today. They are studying bugs this week so I’m playing along. She has Wholly Guacamole frozen in a spider cup. The spider’s 8 eyes and mouth are made from kalamata olives. Underneath are pretzel chips for dipping. At the top right are organic raspberries on spider picks. Below that are strawberries and blueberries on ladybug picks. And at the bottom left are plum sections with a bee pick packed in her LunchBots Quad. My husband has a green salad today to go with his lunch. He has mixed baby greens, organic green zebra stripe heirloom tomatoes, scallions and sugar snap peas. 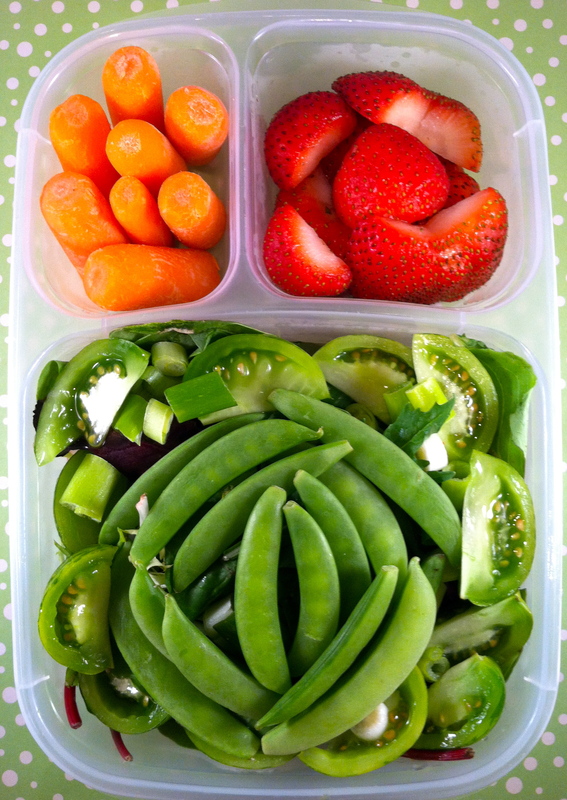 At the top are mini carrots and strawberries packed in his Easy LunchBox container.